Christmas Toy Appeal for Scratch 2017!! 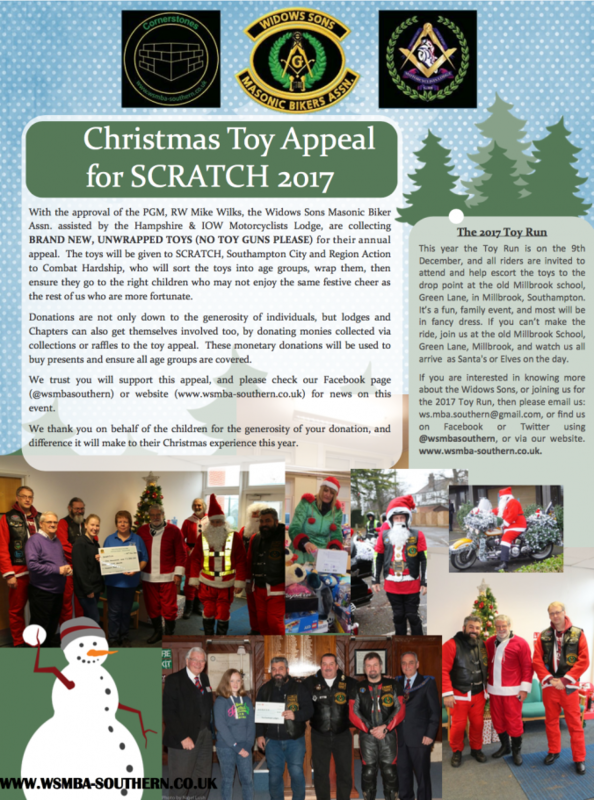 6th October 2017 / Jeremy Ward / Comments Off on Christmas Toy Appeal for Scratch 2017!! With the approval of the Provincial Grand Master, RW. Bro. Mike Wilks, the Widows Sons assisted by the H&IOW Motorcyclists Lodge, are collecting BRAND NEW UNWRAPPED TOYS for their annual appeal (No Toy Guns please). Toys will be donated to SCRATCH, Southampton City and Region Action to Combat Hardship. Please see the flyer attached for further information. Your support will make a huge difference to this years Christmas experience for so many Children.